BIG TEN INCH with cake and cookies! Several Chuck Berry 78s were played in order to salute the passing of the man at the BIG TEN INCH. On Sunday March 26, the BIG TEN INCH held it’s regularly scheduled meeting of shellac enthusiasts at the Hi-Fi Bar in Manhattan. Counting host Phast Phreddie the Boogaloo Omnibus, 13 men came with boxes of 78s to play: Adam Lore, Alex De Laszlo, Andy Upsetter, Bob Pomeroy, John Clemente, Justin CollectorScum, Michael McMahon, DJ Rata, Rich Sibello, Ted Baron and Tony Salvaje. Let’s not forget Juke Joint Jonny, who celebrated his birthday! Juke Joint Jonny celebrates his birthday at the BIG TEN INCH! Soon after The BIG TEN INCH got started, we were joined by a team of roller-hockey players fresh from a game. They stayed on their side of the barroom, we stayed on ours and the only beef we had with them is that when the pizza arrived (there is pizza at every BIG TEN INCH) they quickly snatched a couple slices! In other news, Adam Lore brought about a dozen 78s to give away (The Boog got a cool Ruth Brown 78!) and Michael McMahon brought a bunch of empty 10” sleeves for anyone who wanted them. Everything went to appreciative new owners. Oh, and did I mention that Juke Joint Jonny celebrated his birthday? There was cake, baked by Karen McBurnie (Grade A Fancy) and it was heavenly—everybody said so. Also, Nancy “Jeannie” Gardner baked very delicious oatmeal raisin cookies with chocolate chips and they went very quickly. Folks, the BIG TEN INCH is so much more than just another DJ night—it is a multi-platform, ultra-dynamic experience in magnificent monaural sound where everyone participates! None of these 78s are for sale. Some of them have links to youtubes clips. Click on them and dig what the BIG TEN INCH is all about! John Clemente’s list of 78s that he brought. He actually played those that are ticked off. DJ Rata and Phast Phreddie the Boogaloo Omnibus swing at the Mambo Jambo. 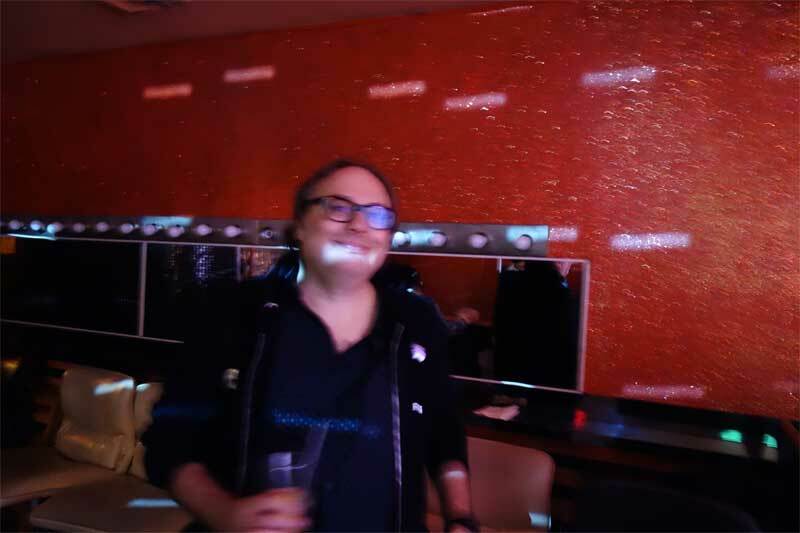 Our pal DJ Rata hosts a groovy night at Otto’s Shrunken Head called Mambo Jambo. It usually takes place on the third Saturday of the month (and sometimes it takes place at the Robert Bar!). At the Mambo Jambo, one may expect to hear plenty of mambo records, that’s for sure… but also Jambo! What does that mean? It means basically that Rata and his guest DJs play all sorts of reet music on these nights—especially jumpin’ blues, Fifties R&B, ska, rocksteady, surf, boogaloo, calypso and rock’n’roll. Otto’s Shrunken Head is the perfect place for such an affair—this kind of music sits well with the punk rock tiki motif of the venue and the clientele bop along with it all night. For Saturday March 18, Rata invited Phast Phreddie the Boogaloo Omnibus to come swing with him. This is a gig The Boog looks forward to. He has a box marked, “mambo,” where he places records that he feels may be appropriate for the Mambo Jambo. Some of them are new acquisitions; others are those that he comes across in his collection that he thinks will be appropriate for the night. Most of these records are cha-chas, latin soul, boogaloos, skas, or somehow mambo-influenced—records that have that certain Spanish tinge. So, when it comes time for an appearance at the Mambo Jambo, The Boog grabs a handful or two of the records in the Mambo Box, then adds some assorted favorite records and/or recent finds into his play box. 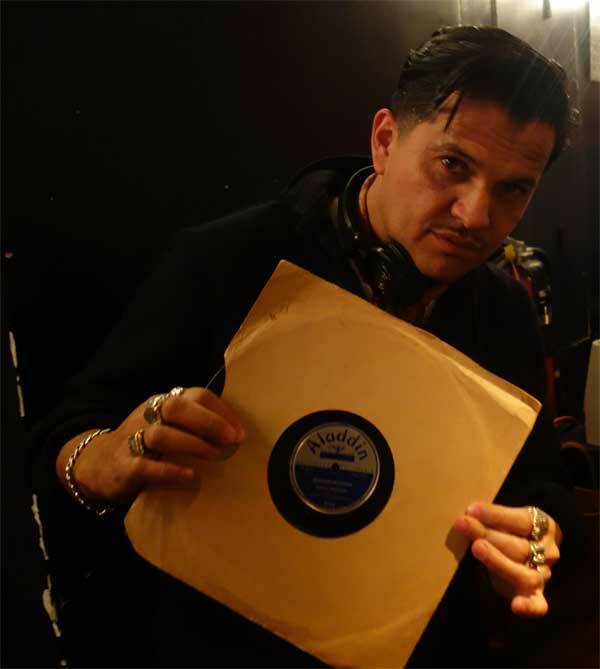 DJ Rata spins a boss mambo record at the Mambo Jambo! Don’t let us forget that another musical giant passed away during the week—James Cotton, the great blues harmonica player. So a track by him was played in tribute. Since this was ostensibly a mambo night of sorts, Phast also played four versions of “Caravan”—one to lead off each of his sets (the first set starting after a three song salute to Chuck Berry). Of course, “Caravan” isn’t really a mambo, however it is often played with a seriously syncopated rhythm that brings to mind Caribbean cultures. For the final hour, Rata and Phast traded spins, playing reggae, cumbia and other jams with exotic rhythms. The vibe of the evening was enhanced further by the presence of two spectacular DJs who showed up to groove: Tony Salvaje and DJ Xerox. None of these records are for sale. Some of the songs listed above have links to the youtubes—click on them and one may recreate the Mambo Jambo experience in the privacy of your own home. All photos by Nancy “Jeannie” Gardner. Dab Van Ommen and Jonny Trash swing at the WHAM-O WATUSI! Saturday the Fourth was the date of the March WHAM-O WATUSI; it was both a blessing and a curse. A blessing because our pals Jonathan Toubin and Todd-O-Phonic Todd had scheduled, for Friday the Third, a fabulous program of boss rock and soul acts at the Warsaw: Nick Waterhouse & his band backing Ural Thomas, Baby Washington, Young Jessie, Maxine Brown, Archie Bell and David Johansen; King Khan; Joe Bataan and his Orchestra; all topped off with a very special performance by the legendary Irma Thomas. A most excellent event, and the Boogaloo Bag writers were in attendance and dug the show immensely. This show drew people from all over the world and The WHAM-O WATUSI benefited when several out of town DJs came knocking, looking for jobs for the following night. 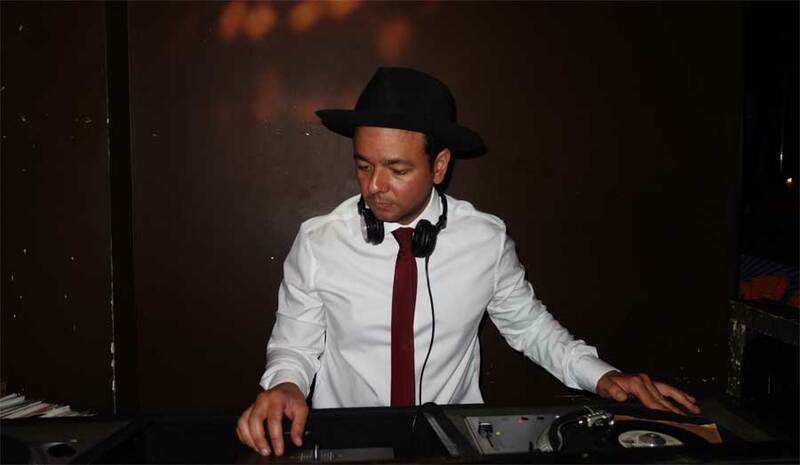 WHAM-O host and resident DJ Phast Phreddie the Boogaloo Omnibus hired on three of them, plus local selector DJ Rata. It was going to be a very swingin’ affair!! DJ Rata, Lilly Martini & Dab Van Ommen swing at the WHAM-O WATUSI! Then, perhaps a few weeks before the big weekend arrived, it was announced that Mr. Toubin had scheduled another slightly less heavy but still quite fabulous show at Baby’s All Right (with Nick Waterhouse, King Khan, Ural Thomas and Eli Paperboy Reed in the performance space and more than a dozen fabulous DJs spinning in the front room) for Saturday the Fourth. Mr. Toubin even invited a couple of WHAM-O DJs to work at his event! But all was not lost. The WHAM-O WATUSI took place as scheduled at the friendly confines of The Bootleg Bar, where WHAM-O attendees were in abundance in spite of the hipper gig across town. Guest DJs included Jonny Trash (Spankys; Peterborough, Ontario), Dab Van Ommen (Utrecht, Netherlands), DJ Alr!ght (Secret Soul Club, Cleveland) plus our pal DJ Rata. Everybody took turns spinning their rockin’ 45s with host Phast Phreddie the Boogaloo Omnibus. Excellent records were played, new friends were made (including Chelsea Hartman, Jay Nugent and Lilly Martini, who provided the Bag with some photos) and old friends turned up to jump around. DJ Alr!ight and Jonny Trash performed their respective sets early in the night, hung out for a spell, then took off for Baby’s All Right. Mr. Van Ommen and Rata stayed to make noise well into the wee hours. DJ Alr!ght swings at the WHAM-O WATUSI! The Boogaloo Bag writers first became aware of DJ Alr!ght at the Keystone State Soul Weekender last year. Although his DJ sets were not witnessed, music was discussed intensely and it was determined that DJ Alr!ght has all the right records and attitude. Jonny Trash swings at WHAM-O WATUSI!! Jonny Trash came to us via SMA-F (social media apparatus: facedog). He owns a joint called Spanky’s in Peterborough, Ontario that apparently features reet music every night and has hosted Jonathan Toubin’s Soul Clap events there. So you know he’s got the goods. Chelsea Harman, Dab Van Ommen and Jay Nugent swing at WHAM-O WATUSI!!! Dab Van Ommen came to our attention via DJ Rata. The two of them have DJed together, both in New York, as well as in Mr. Van Ommen’s home town of Utrecht, where he hosts many fine parties—some dealing with reggae music. DJ Rata swings at the WHAM-O WATUSI! Of course, DJ Rata is DJ Rata, a frequent guest DJ at the WHAM-O and one can read about him in many past Boogaloo Bag posts, such as this one and this one. Not only did each DJ play incredible records, some of them came bearing gifts. DJ Alr!ght presented the Phastman with his recent mix CD. DJ Rata gave the Boog a cool Swing-A-Ling record. Our new Dutch friend gave everyone a copy of the EP Go Sound by The Riddlers, a fantastic surf combo Mr. Van Ommen played guitar with during the Nineties. He also gave the Boog a cool 45 by the Nederbeat group Ro-D-Ys. None of these records are for sale. Some of the songs listed above have links to the youtubes–click on them and recreate the WHAM-O WATUSI scene in the privacy of your own environment!